The Photo Sensor measures the screen brightness and, when combined with StimTrak, generates a trigger at the exact stimulus onset. It is a valuable tool to check the performance of a monitor or any experiment control software. This becomes essential if visual stimuli are planned to be presented on a tablet or cell phone display. The Photo Sensor is a new sensor from Brain Products. It can easily be attached to any screen with double-sided adhesive washers. Connected to the auxiliary input of an amplifier, it provides information on the brightness of the screen. In other words: The signal delivered by the sensor indicates when the screen turns brighter or darker. Used in combination with StimTrak, a trigger is generated when the amount of light is higher than the (customizable) threshold, which means that the exact onset of any visual stimulus can be marked. By recording the sensor signal with an EEG amplifier, the visual experiment setup can be fully checked. Is the monitor which is planned to be used suitable for visual experiments? How many frames are needed in order to show the brightest white following the darkest black – or vice versa? Is the brightness level stable across the repeated presentation of the same stimulus? This kind of investigation was carried out and published by Wang and Nikolic in 2011 (see this article for more details). Taken advantage from the fact that an EEG amplifier also records the triggers sent by the experiment control software, the marker timing accuracy can also be quantified. The same principle was already shown in the acoustical modality (please refer to the article presented in the previous Press Release). Visual-evoked potential demonstration at the SfN conference 2014 (Washington, USA). On a large cell phone display a reversing checkerboard pattern was shown. The Photo Sensor and StimTrak detected the stimulus onset. actiCAP Xpress electrodes and a V-Amp amplifier were acquiring EEG signal. Combining the Photo Sensor with StimTrak opens up entirely new possibilities in visual experiments, like using a smart phone for delivering the stimuli with absolutely precise markers. It is not just unusual, it also might even seem unfeasible to acquire reliable ERPs using this setup. 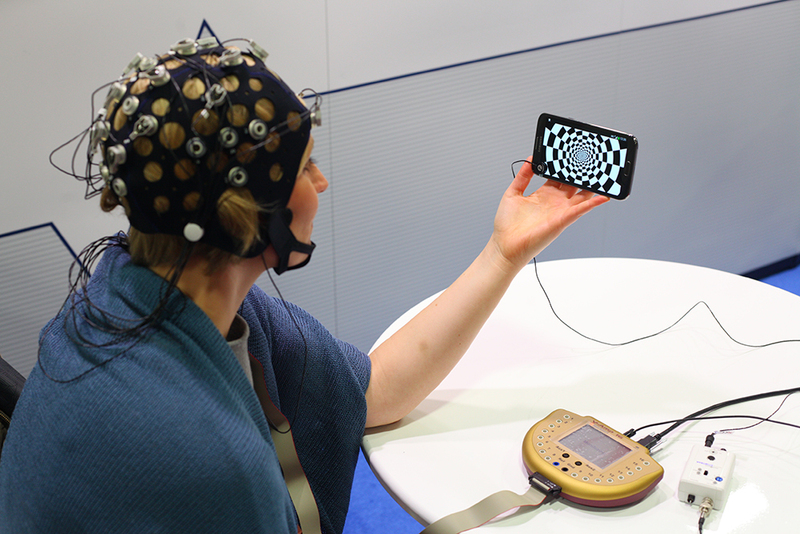 However, this exactly is what we did just recently during this year’s SfN conference: On a rather large cell phone display an animated gif was played in a continuous loop showing a reversing checkerboard pattern. The same type of stimuli were used in the experiment of Sandmann at al. (2012), which has already been published in our Press Release (April 2012). As you can see in the picture on the right, a Photo Sensor was attached to the screen and triggers were generated by StimTrak. 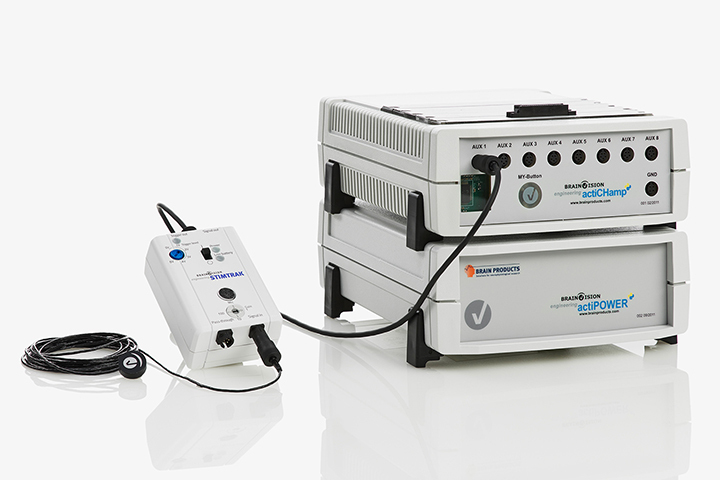 To make the setup even more exceptional, actiCAP Xpress dry electrodes acquired the signal. The ERPs over the occipital area were the same as shown in the article by Sandmann. Quite good results from one single subject, recorded by dry electrodes in a convention. 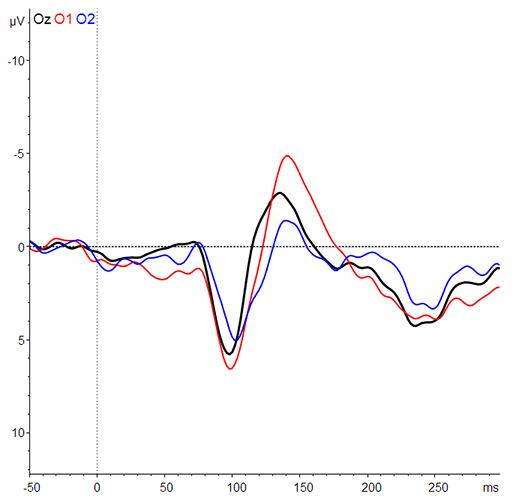 Single subject visual-evoked potentials (VEPs) measured at channel Oz (black), O1 (red) and O2 (blue). The data was recorded at the SfN conference. The raw data was filtered (band pass 1 – 45 Hz), baseline corrected and averaged (number of trials: 129). P100 and N150 are clearly visible, similarly to the publication by Sandmann (2012). The combination of the Photo Sensor with StimTrak can significantly simplify the experimental setup. One may still argue that the checkerboard is a special experiment since only few different types of triggers are needed and therefore the experiment can be performed even with the one bit output of StimTrak. That is true. Photo sensors are often used in a way that provides only binary information: The corner of the stimulation frame under the Photo Sensor changes from black to white in order to mark the onset time. That is great, but it makes it impossible to distinguish between different stimuli. Many tracker devices cannot offer more, only black and white or rather zero or one. Let me show you how our equipment can provide more than one bit of information delivered by the Photo Sensor. Please check the next picture. Here, not only black and white frames were presented, but rather multiple shades of grey. As the result shows, the different grey levels are clearly distinguishable. In case the stimuli are coded with different grey values, it is possible to tell not only the exact onset, but also to identify what kind of stimulus appeared on the screen based on the signal recorded with the Photo Sensor. Black to White (left): Signal of Photo Sensor recorded through auxiliary input port. 11 grey levels were presented with 10% brightness differences from 0% (black – left side) to 100% (white – right side) on a standard LCD monitor. The data was acquired by an actiCHamp amplifier (sampling rate: 2000 Hz). The result showed (raw data – grey line) that the monitor did not provide a constant brightness value, rather the amount of light was dropped in every 16.6 ms (corresponding to the 60 Hz refresh rate). This activity is more visible in the enlarged area (blue rectangular). The Photo Sensor data also shows how many frames are needed to reach the next brightness level (7 frames at the enlarged transition). Based on the Photo Sensor data it can be evaluated whether the monitor is suitable for visual evoked experiments. The 60 Hz activity was eliminated by a 40 Hz low pass filter (red line). Please note that the different grey levels are clearly distinguishable on a standard LCD monitor. Finest Grey Steps (right): Signal of Photo Sensor recorded through auxiliary input port. 8 grey levels were presented with the smallest possible differences (between 123 and 130 values on a 256 level – 8 bit – grey scale) on a standard LCD monitor. Differences in grey levels are slight and therefore almost indiscernible. The data was acquired by an actiCHamp amplifier (sampling rate: 2000 Hz). The result showed (raw data – grey line) the 60 Hz activity as discussed above, which was eliminated by a 40 Hz low pass filter (red line). Please note that even smallest differences in grey levels are distinguishable on a standard LCD monitor. One more technical argument. Photo diodes or photo resistors can be used to measure the brightness of the screen. Photo resistors as used by some products on the market are known to act as low pass filters. Filtering a signal, which is characterized by sudden changes, leads to inaccurate timing. Photo diodes are clearly superior here since they are able to reproduce the signal more accurately. It is needless to say that the Brain Products Photo Sensor contains a photo diode. If you are running visual experiments, I am sure you are interested to learn more about our Photo Sensor. Don’t hesitate to write to us directly at sales@brainproducts.com or contact your local distributor.